Travers Brothership's newest release "A Way To Survive" is a powerhouse album. 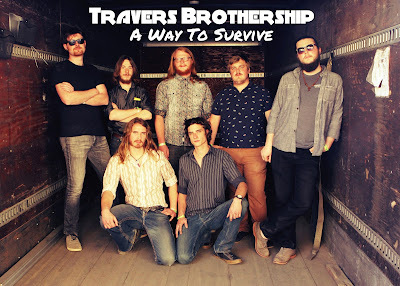 Travers Brothership is experiencing their "Golden Age" says Kyle Travers, half of the twin brother team that leads this impressively soulful project. One only has to spend 10 seconds listening to their new, kickstarter fan-funded album A Way To Survive to believe him. Boasting the wealth of four songwriters within the band, A Way To Survive takes us back decades to the golden age of rock and roll, when albums were meant to be listened to in one complete sitting. To when bands enjoyed the process of recording and used the recorded album format as a jump-off point for creativity and experimentation. To when the song was a mere starting point, and layers of instrumental interplay were recorded with both care and thoughtful intention. A Way To Survive opens with "Hold My Name," written and sung by bassist Josh Clark. The teasingly soft bass, organ, and guitar intro lays a quick foundation for the punctuated horn lines to announce the fully realized musical experience that's about to take place. Clark's voice is on the front lines of the Southern Soul and R&B revolution taking place in today's live music scene, with singers like Paul Janeway from St Paul and The Broken Bones. Listening to A Way To Survive, you can't escape the feeling that this album wasn't made in today's times. It was somehow unearthed from the early 70s, when vocals and song structure were as important, and many times more important, than instrumental prowess. Before prog-rock and jambands, songs were based around the other-world sense of hearing human voices work together. From The Beatles to The Doobie Brothers, you connected with those voices first, simply because the voice is universal. Travers Brothership is reminding us of this lost art. "Time Will Slip Away," written by Eric Travers, who's primarily on drums, (they regularly switch instruments) is a funk-bass driven rocker that features their "secret weapon," Ian McIsaac, on both keys and percussion. "We didn't want to over-produce it," says Kyle Travers, "but we wanted to add some elements that took it away from the bare-bones Brothership." Half way through, the song morphs into a conga-led percussive breakdown that builds up into the inter-weaving of organ and guitar phrases. A subtle tease of the longer jams you'll find in the Travers Brothership live shows. While many bands place their stripped down acoustic track at the end of the album, these guys made the bold choice to feature it directly in the middle of the A-side. As a counterbalance to the more complex arrangements, "The Road Interlude" is a two chord groovy meditation on the late night drives and existential adventures of band life throughout the southeastern United States. Few albums in the last couple of decades have brought forth the spirit of Muscle Shoals as A Way To Survive does here. The guys in Travers Brothership make the complex sound simple, and have the patience and discipline to allow the simple to sound complex--a universal artistic goal that few achieve. Kyle is correct: this is their "Golden Age." All their efforts, along with recording engineer Matt Williams in his studio Eagle Room, have produced an album powerful enough to raise their sound from the southeast into the national scene. There are hundreds of great bands aiming for the major leagues, but few of them bring such a complete package as Travers Brothership. In this horse race, I've found where I'm putting my money. 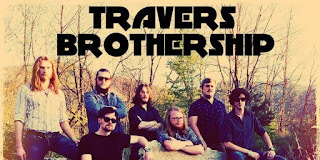 Find Travers Brothership tour dates here. In this episode, I catch up with Kyle Travers, one of the twin brothers that leads the Asheville based band Travers Brothership. This is a band you're almost guaranteed to love from the moment you hear the first song. A funky, soulful, southern inspired groove that uses horn lines and 4-part harmonies with ease and playfulness. We talk about how their dad inspired them to dive headfirst into music and how removing the ego is the best way to create great moments in the studio. We listen to 5 songs from their new album "A Way To Survive"
This is our last week of partnering with Front Porch Fest for 2016. The festival is Sept 2-4 and my band, Big Daddy Love, will be playing Saturday evening from 7:00-8:30pm. We want to thank them for everything and look forward to seeing everyone there this weekend!